Say Goodbye to Kick stains on your seat! • Are you having problems with keeping the back of your front seat vehicles clean? • Are you having problems with keeping your car seat free from books, journals and other personal items? • Then buy this KidLuf Car kick mats today because it is exactly right for you! KidLuf car kick mats is designed to help keep the back of your front car seats clean, tidy and free from kick stains. It offers a comfortable solution for retaining the neatness and tidiness of your vehicle interiors whenever you have kids on board. KidLuf car kick mats are made from thick waterproof material, which makes them extremely resistant to muddy and wet stains. Unlike other brands of kick mats, KidLuf kick mats are very durable and guaranteed to last even after prolonged and continuous use. With a width of 18.1 inches and a height of 25 inches, these kick mats are unarguably the largest kick mats on the market. Each mat features 2 adjustable straps, for attaching to the headrest and lower bottom positions of your front vehicle seat. Each mat also features an organizing pocket for storing different items. These pockets help you control and avoid litter on your vehicle seat. They are easy to clean and require little or no maintenance. Get this kick mat today and never have to worry about the back of your front car seats getting kick stains, ever again! QUALITY PRODUCT: KidLuf Car Kick Mats are manufactured from premium quality materials with durable thickness and high water resistance. They are sturdy and offer 1 year guarantee. EXTENSIVELY LARGE SIZE: With a size specification that covers and protects the seat of your car or SUV completely, KidLuf car kick mats are guaranteed to provide the much needed functionality while in use. Width=18.1inches, Height=25 inches. 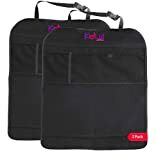 VERSATILE USABILITY: Each KidLuf Car kick mat has useful organizer pockets for storing your personal items like books, pens, journals etc. This allows you to keep your car seat free and tidy at all times. EASY TO SETUP: Each Car kick mat has 2 adjustable straps and buckles for attaching to the headrest and bottom back position of the car seat. These straps are foolproof and extremely easy to use. TOTAL PROTECTION: KidLuf Car kick mats effectively protect the back of your front car seats from kick stains, shoe prints and liquid spills. This helps you to maintain the neatness of your car seat completely.